In honor of our launch of SoHo Living, a line of England Furniture that caters to smaller spaces, we’re providing tips to make that tiny space feel bigger than it actually is. Whether you live in an apartment, condo, or you just have limited space in your living room, these tips can really help open up the room. A new coat of paint does wonders for a room. Choose a light airy color to make your space feel more open. Use mirrors to brighten a space! Adding a large mirror can completely change your room, injecting light and a sense of space where previously there was none. Using pieces to highlight walls is a great way to add character without taking up too much space. Decorate with small items and neutral art for a less cluttered feel. A storage ottoman can be the perfect way to hide things like magazines or extra throws, so you’ll feel like your space is messy less often. Do you frequently host guests? Turn your living room into a guest room with a sleeper sofa. Cocktail tables and dressers that are lifted off the floor create an illusion of more floor space. Hang your curtains to the ceiling! This helps elongate the room and makes it feel much taller than it really is. Use open shelving such as floating shelves or ladder shelves. These are great storage solutions when you don’t want to take up precious floor space! Layering rugs can add depth and texture to your small space. It takes up no space and will give a sense of style without taking up any valuable room. Wall mounted lighting can be your best friend. Instead of table and floor lamps, mounted lighting can free up your space. If you love these tips, like England Furniture on Facebook for more design inspiration. If you aim to buy American and support local business, you might be thinking about finding a furniture manufacturer right in the United States. There is no shortage of talented craftsmen in America, and England Furniture has taken advantage of that by setting up shop right in Tennessee. 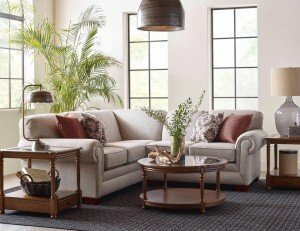 Here are just some benefits of buying American-made furniture. Helping out fellow Americans is as easy as buying American-made products. 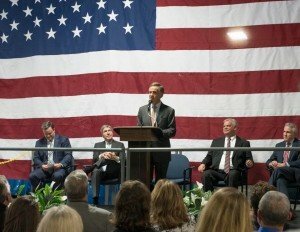 In fact, England Furniture recently announced an expansion to their factory in Tennessee where 200 new jobs are being created. 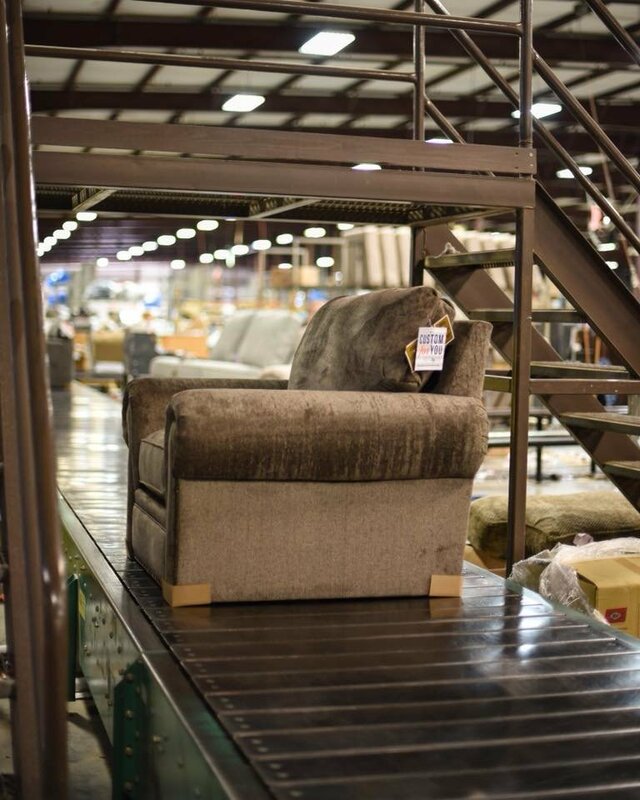 The amount of gas and diesel burned to ship furniture from overseas is staggering–and it will take more gasoline yet to get that furniture into your home. Less smog in the air is a win for everyone! England Furniture has been known for their expedient manufacturing processes since the 1960’s. In three weeks or less, England Furniture gets orders out the door, so you can have your customized piece quick! Learn more about England Furniture and #PlantTourTuesday by joining the online community! Pictured is the Brett chair. Letting that warm springtime feeling inside after a cold winter is one of the best parts of the seasons changing. Welcome the sunshine indoors by refreshing your space. 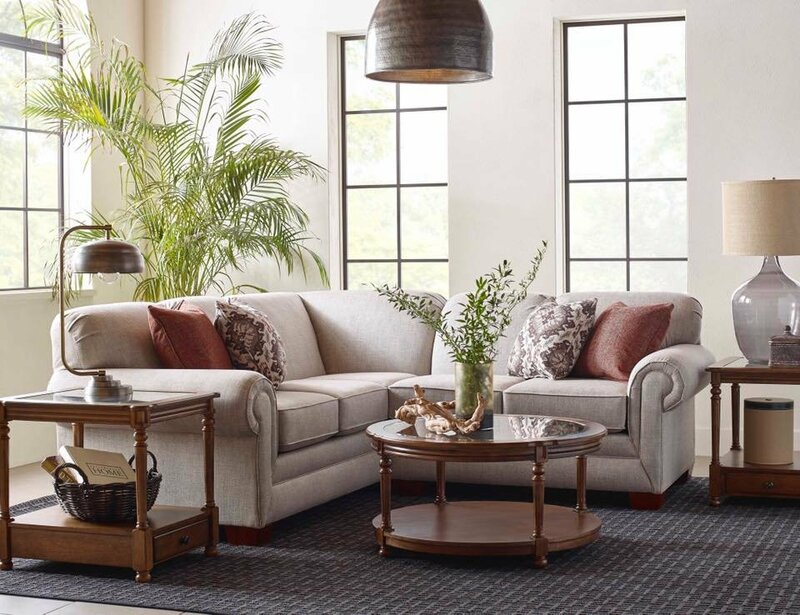 Spring cleaning is more than just dusting—think about starting the new season with a better living room furniture set! Spring cleaning can become a fun family tradition. Get some music playing, assign tasks, and get the whole family in a cleaning competition! Add some plants into your space. Humans are naturally drawn to nature, and adding a vivacious green plant—real or fake—can help bring the budding branches indoors. Store away heavy blankets and transition into the light, airy feeling of spring. Swap out those dark, heavy curtains with light, sheer ones! If you are considering a new piece of furniture, you will want one that can easily transition through all seasons. 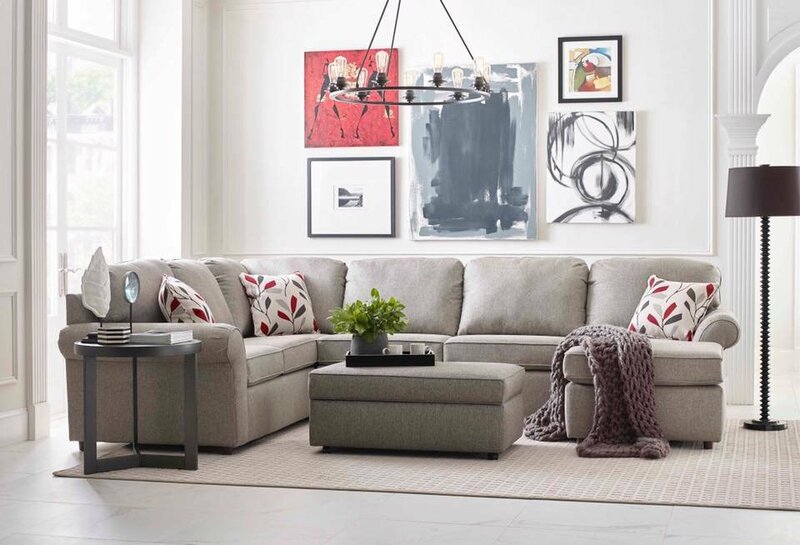 The light gray upholstery on this England Furniture Monroe Sectional (pictured) can look chic in any season. If the term “Made in America” is important to you, then the England Furniture Company is who you can trust for quality furniture that will stand the test of time. 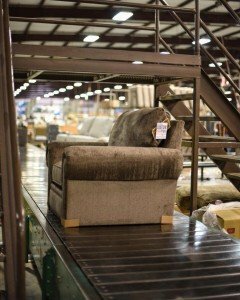 England Furniture produces each piece in the foothills of Tennessee, and was created in 1964 with the goal in mind of employing hardworking Americans. 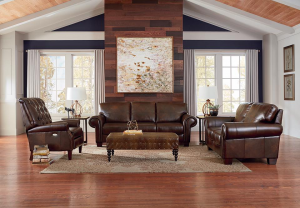 Classic American leather furniture is embodied by the River West Chair in leather. This piece is timeless with straight, refined features like the track arm. 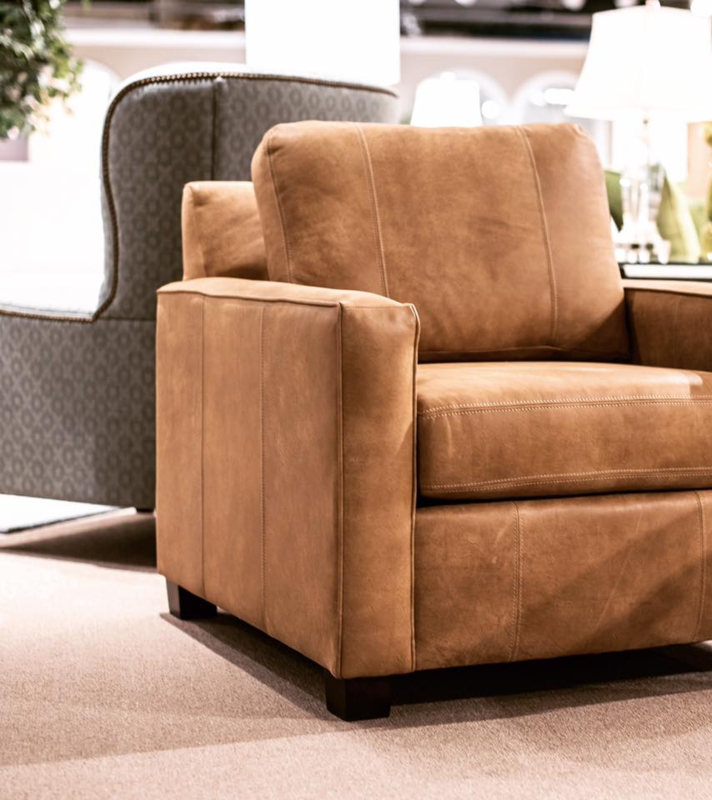 This chair is finished off with a beautiful light brown leather. 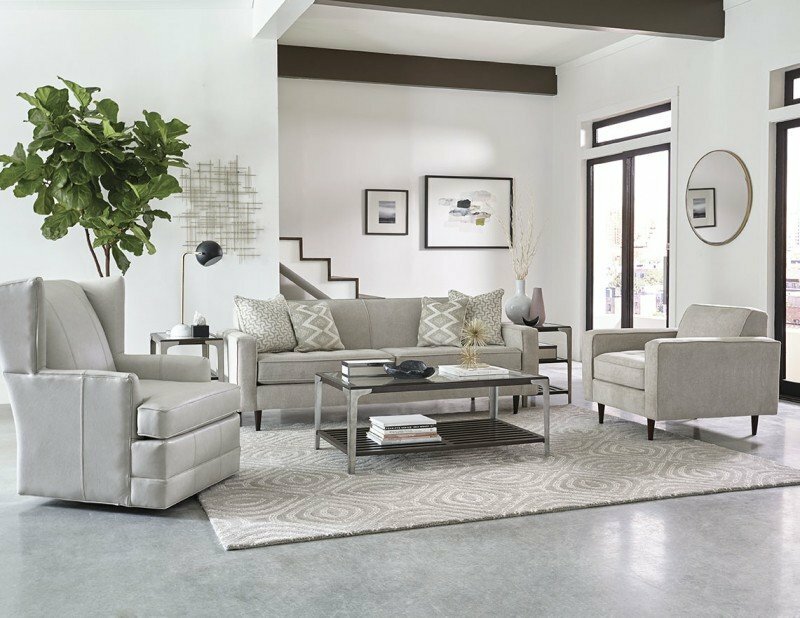 In the River West Collection, you can also find a loveseat, sofa, ottoman, sectional and queen sleeper. Is it time to buy a new sofa? If so, your head may be spinning with all the different types available to you. One of the best options is to consider a sleeper sofa. It can help save you money, optimize your space, and increase your comfort. 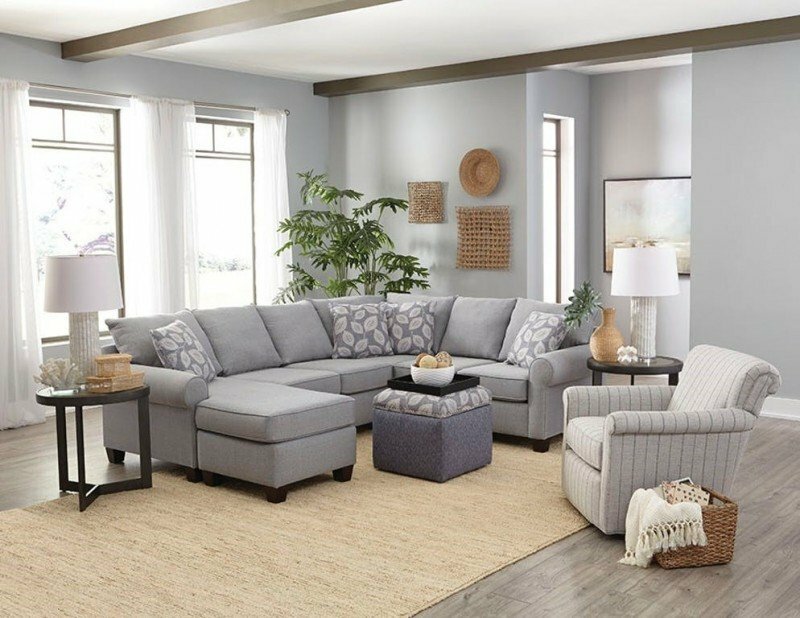 When you consider the average cost of sofa and the average cost of queen size bed, purchasing a sleeper sofa – 2 pieces of furniture in one – can really save you some money. A sleeper sofa also means you won’t have to pay to decorate and furnish a guest room. The sofa creates both a comfortable living room and an inviting guest bedroom. Sleeper loveseats and sofas are ideal for smaller homes and apartments where full size furniture would cramp the space. With a guest bedroom, you can create a dual purpose space – home office, craft room or den and private guest space. Some sofa beds are known for being quite uncomfortable, but England Furniture sleepers are the epitome of comfort. Just check out our air mattresses, our Visco sleeper mattress, and our Custom Comfort innerspring mattresses. A sleeper can help you to (literally!) stay close to your friends, family and loved ones. 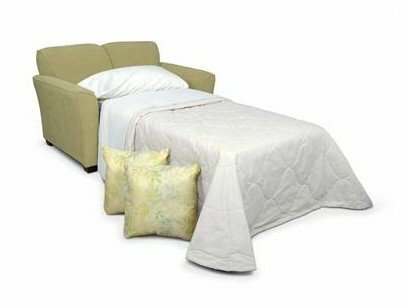 A sleeper sofa comes in handy for out-of-town guest who are feeling unwell and need a place to stay. The great to have when you hold movie nights and someone wants to stay over. If you’re holding an event and the weather gets too bad for driving, a sleeper sofa can save the day. Start making your memories today with your new England Furniture sleeper sofa. 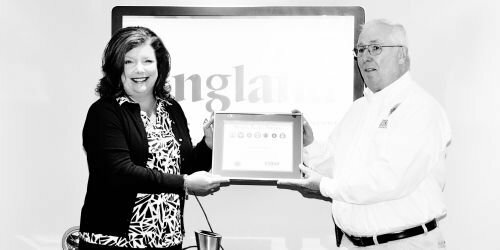 The Seven Seals Award from the National Guard has been presented to England Furniture. This award is in recognition of a significant individual or organizational achievement, initiative, or support that promotes and supports the Employer Support of the Guard and Reserve (ESGR) mission, to include the efforts of the more than 4,700 volunteers who carry out ESGR’s mission across the Nation on a daily basis. We are honored to support our troops! When selecting furniture for your home it’s just practical to consider items that could go into any room. Consider the tips below to help you choose furniture – and accessory pieces – that work in a variety of room sizes, can be moved from room to room, and can even offer some storage options. When furnishing a living room consider two loveseats over one large sofa. They’re easier to move and can be place in a variety of ways. Be creative with your tables. Choose interesting bases and use plate glass for the top. Use these in a living room or as nightstands by a bed. Unless you have a large home, select furniture and accessories that are on a small scale. They’ll fit into most spaces as you move them around in your home. When you’re arranging furniture, try to think ‘outside the box’ and use things in unexpected ways. Place a loveseat at the end of a bed or use a dresser to hold DVDs and entertainment equipment. Choose a color scheme and stick to it. If you carry the colors throughout your home, you’ll be able to move furniture and accessories from room to room. Storage is in short supply in most homes. Select furniture pieces that offer drawers or hanging space, such as a chest of drawers or an armoire. They can be used in a bedroom, living room, mudroom, foyer, and more. Gather together a collection of pillows, fabrics, and accessories that harmonize with your primary color choices. You’ll be able to change the look with the seasons, giving your furniture a new, fresh look throughout the year. Buy side chair, pillows, lamps, and vases in pairs. They’ll add symmetry to a room and, you’ll also have the option of using each piece in a separate room if desires. If there ever was a versatile piece of furniture it is a chest of drawers. A chest of drawers can fit into almost any room. Some are tall and narrow and have abundant drawers. Some are small and can be a nightstand in your bedroom while others are large enough to hold a whole season of clothes. Is there anything a chest of drawers can’t do? The storage options are endless with your chest of drawers. The top of a large and tall chest is a great place to display photos, baskets, and plants. The top of a short chest of drawers is a great place for things like candles, flowers, a television, a lamp, and/or books. Whether the chest has 2 drawers or 12 drawers, whether your chest of drawers looks decorative or is simply a utilitarian piece, the drawers can hide all sort of items: photos, dining items, clothes, hobby supplies, knick-knack, and more! Here are some ways you can use your chest of drawers to store things all around the home. If your foyer or entryway is large enough, a chest of drawers can be the perfect small piece of furniture. Use the drawers of the chest to hold scarves, keys, gloves, umbrellas, and mail. A small chest of drawers at the entry is perfect for holding mittens, hats, shopping lists, and coupons. Any low chest of drawers looks great with a beautiful plant or decorative vase on top of it. You can also hang a mirror over the chest and place a lamp on top. Any long, low chest can take the place of a sideboard. Use the top of your chest of drawers for serving dinners and use the drawers themselves to store things like napkins, trays, placemats, tablecloths, serving dishes, and candles. A smaller chest offers you a place to hold a beautiful plant or floral arrangement, a tea set, and/or seasonal decorations. Use a chest of drawers in your bathroom to help break up the space. A tall chest can hold things such as bathrobes, beauty and medical supplies, towels, and washcloths. A small chest placed on a wall near the bath or shower is perfect for bath supplies and towels. House guests are glad when they have a place to store their personal belongings during their visits. You can also use some drawers to store holiday items such as gift wrap, tags, ribbons, pens, scissors, pens, and scotch tape. Or you can use them to hold craft and hobby supplies including scrapbooking items, sewing items, or fabrics. Read more on England Furniture. July is best known for a very special holiday, Independence Day. We all have many ways to celebrate America’s birthday, but what better way than have the color of the month be carnival red. The color red is a warm and optimistic color; it is energizing and encourages us to take action. Red may seem like a fall color, but it works in the summer if it is paired the right way. Red is perfect for this summer as it radiates a strong energy and promotes ambition. You can incorporate red in your living room with one of our many England Furniture rugs. Consider our England Bel Air, England Fresco or England Illusions. Eah would give you a pop of red in your home! Check out HGTV for more ways to incorporate the color of the month into your life.